These two shiny gnomes are by Gregor Kregar (we have seen his Immersive Echo yesterday, and his flock of cornered sheep at the TSB Bank Wallace Art Centre). They are entitled “Reflective Lullaby”. Made from marine grade stainless steel, they will set you back NZD 20,000 a piece. 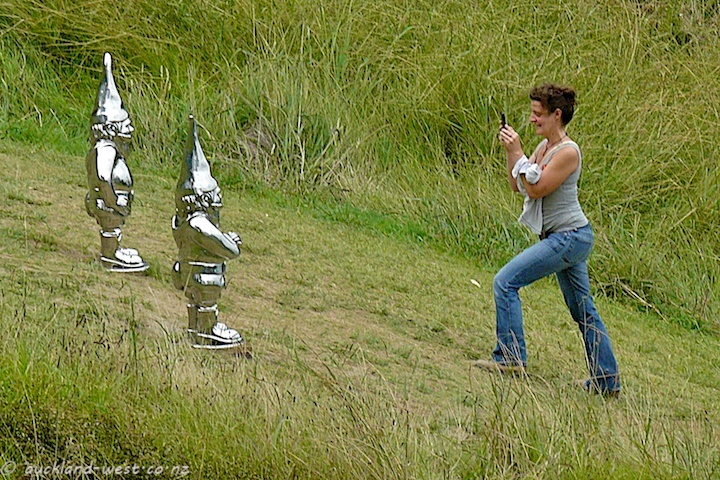 At Headlands Sculpture on the Gulf on Waiheke Island (January 28 to February 20). Part of the enjoyment of art exhibitions is “people watching”. In the solemn setting of museums, this has to be practiced with due restraint. By contrast, open-air events can be much more in your face, camera at the ready.